I finally got around to tackling the daunting task of organizing my closet which I've been meaning to do for quite some time now. My sweaters were haphazardly strewn onto shelves, my jeans were in complete disarray and I was finding items that I had forgotten about because they managed to get jammed in the back of my closet. I know that keeping my closet neat and organized will always be a work in progress, but I wanted to share some organization tips that help me make the most of my space. Now if I can only get my husband to let me have his half of the closet! Using slim hangers has tripled my closet space! 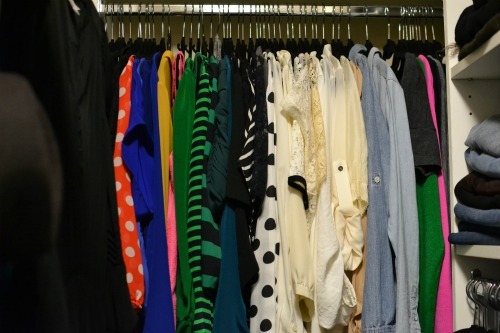 OMG, i love your closet! Looks great, love the shoe shelves! It looks so lovely! I need to do this with my closet.. Thanks for sharing! such a cute closet! i spotted all those shoes immediately!!! i need something like this, my clothes are thrown everywhere and i can never find what i want. love what you did with your closet. i love the feeling of an organized closet! Those aubergine Miu Miu's are to die for! You closet looks so well organized now! Mine is such a mess, I really need to get those slimmer hangs because I'm always running out of room. A task that is on my 'to do' list for my house, organization in the closet!! Go girl! I am loving this post! I recently did my closet and you have inspired me to do a post! Also there is nothing better than an organized closet! I'm so jealous of your closet! you have so much space!! Lucky lady!! I am also need to organise my closet. Yours looks super organised, good job! So organized! I need some of this in my life! Your collection of shoes is incredible! Can I live in your closet?! Hehe. 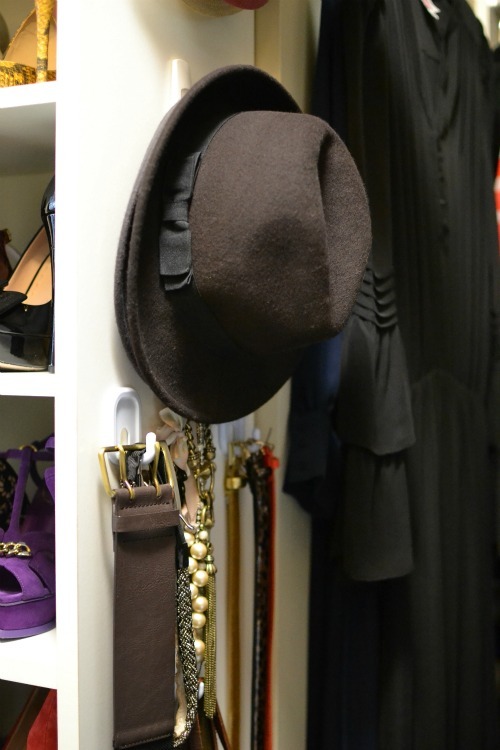 um hi, your closet is gorgeous! So jealous right now... my sf apt. is way too small to have a closet this organized. Love it! Omg, I love your shoe collection!!! Its awesome!!! I'm so envious! You have the most gorgeous collection of shoes and bags. Your closet is perfection! It's so much easier getting dressed in the morning when you can see everything. I want to live in your closet and then wear all of your clothes and carry all your bags. Is that weird? haha. Yes, I know that it's weird. You don't have to answer that. And if you've already called the police, I totally understand. Love this post, Audrey! 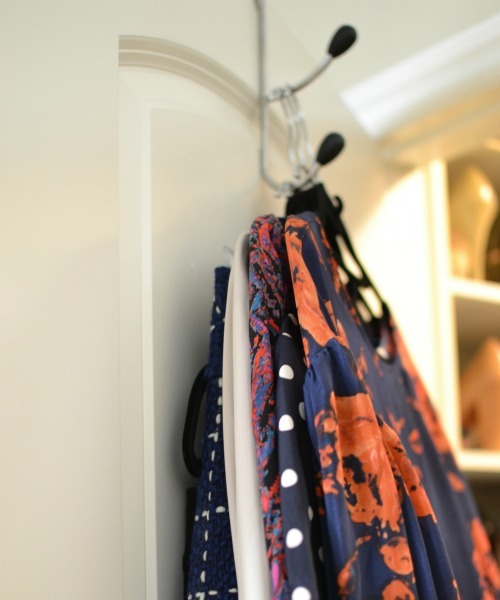 I always enjoy seeing the inside of closets -- especially from darling fashionistas such as yourself! ;) We have similar closets! I have the same shelving! Wow. I'm so jealous of your closet! GIVE ME IT!! Just curious if you're renting space in your closet, as I'd like to live in it. No joke - dream closet. I just moved, and my closet got a little more bigger, but I'm still dreaming of the day when I can display my shoes just like you did! Wow, such a fabulous closet. You shoes collection is to die for !!! Thanks for sharing. Such a well organized closet! Everything looks so beautifully displayed! I need to learn from this, mine is in such chaos! You have an amazing closet. Love your clothes. They look so expensive especially your shoe collection. I admire you for getting organized! Doesn't it feel great? My tops are also organized by style and color, but my sweaters not so much. Kudos to you! I'm green with envy, I wish I had a closet that size! Wow! I'm lusting over the vast amount of pieces you have in your wardrobe! So many possibilities! :) I love how organized you are - it definitely makes getting ready in the mornings a joy, doesn't it? Hahaha, I have exactly the same problem... But your shoe and bag collection is aaaa-mazing! This post motivates me to get my own closet organised again, since I'm back from Paris, my room is one big fashion explosion! ;) Lots of love, hope you're well! xoxo M.
i love your items and i like your blog very much! i would be very happy, if you could check out mine! So nicely organized! Note to self: clean up shoe closet! I'm jealous of not only the beautiful pieces in your closet, but of your huge closet as well!! So happy to have stumbled upon your blog, you have fantastic style! I love your laid back look. I really need to get around to doing this!! Your organization looks great! Would love if you could stop by my blog and tell me what you think of my latest posts! Follow me, I follow you?! That closet looks great...wish I had that much room! Your organization is great...totally gels with me, the organizing freak! I swear,I could live in your closet!I love room closets,have one in my apartment and I adore how you perfectly organized everything!I have to buy those slim hangers! and your shoes look amazing ! Can all the girls agree that JEALOUSY is the word to describe this closet?! Fantastic!!! Thanks for commenting on my blog! Your closet looks amazing; I'm so envious! I'm so jealous -- I wish mine looked like that! Wow, everything looks fantastic! And your shoe collection is to die for. Perfection! I love your closet, and those fabulous yellow snakeskin heels. :) Enjoy your weekend. WOW! so much lovelies in here! Yep, totally jealous of your closet. Want to come organize mine? I'm your new follower and i would love top have you following me back!! 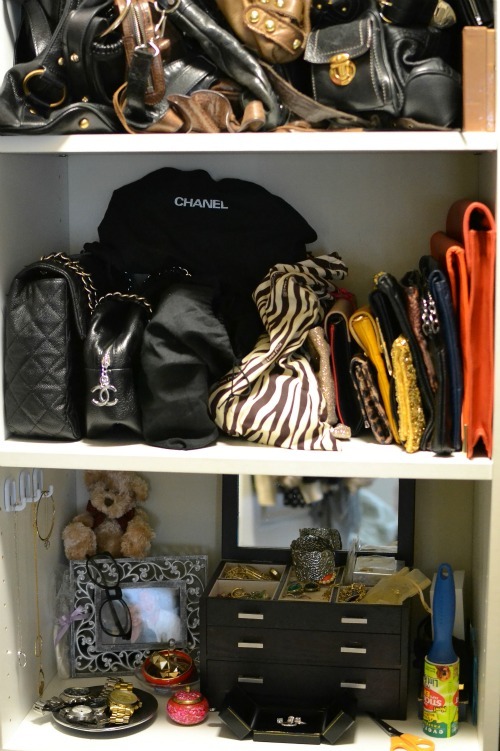 that would be a dream closet for me, wonderful! you have so many different colors and patterns in your wardrobe, I'm trying to add more color to mine in 2012! and I wanted to thank you for all your inspirational outfits, I love reading your blog and I don't know why but I haven't followed you yet.. But from today on you have a new follower via bloglovin! Your closet is so amazing! I really like the layout of your closet—it has so many different parts. Great organization! OMG!!!!! IT'S MY DREAM!!!! love it!